Internet Archaeol. 25. Williams. Chronology and contemporaneous landscapes. The majority of the landscape reflects the city destroyed at the time of the Mongol sack in AD 1221. There may have been areas of the city, or individual properties, which were abandoned earlier: there are suggestions that the city had been contracting for decades before the sack (Kennedy 1999, 38). The use of a few buildings may post-date this sack: the surface scatter data (Fig. 20 - opens GIS) shows a concentration of Mongol material near the centre of the city and the area of the citadel, Shahriyar Ark. Excavations in both these areas have suggested that buildings may have been reused or adapted after the sack, often continuing the layout of the pre-Mongol building, but adapting it to a new use. 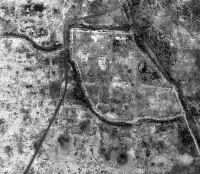 However, overall, it still seems reasonable to suppose that the majority of the buildings, streets and open spaces in the aerial images provide a snapshot of the late 12th/early 13th century urban landscape. Figure 26: The area of citadel, Shahriyar Ark, on the IKONOS satellite image (north to top). Note the clear lines of earlier city streets, both a major east-west street but also north-south streets, which are blocked by the construction of the citadel wall c. AD 1080. Not withstanding this, it may also be possible to hypothesise on the chronological development of the city, based upon elements of the plan visible in the imagery. Major changes in street alignments (e.g. significant changes in a group of streets), or the changing character of the built space across the town (e.g. the density or type of housing), might reflect the development of the urban landscape over time. In places, it is also possible to see a palimpsest of layouts when new features have been imposed upon the existing layout (e.g. the construction of the late 11th-century citadel Shahriyar Ark over the top of an earlier street system – see Fig. 26).